In the 1840s, three children were born to a Mr. and Mrs. Bolton. It is possible Mrs. Bolton was born Ann Scanlon. They lived in West Gwilliimbury Township, near the Mark Scanlon family. The children were - John born 1841, William 1843, and Mary Ann 1845. A falling tree killed Mr. Bolton, leaving Ann a young widow with three small children. 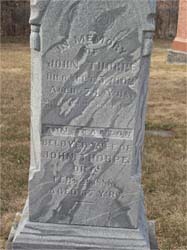 About 1847, Ann married John Thorpe who lived nearby. Together they raised Ann's three children and had a family of their own. John Bolton married Margaret Jane Steele, the daughter of James Steele. In 1866 they were living on an acre of land, and John was working as a labourer. They had seven children, but only three survived to adulthood - Henry, Evelyn and Lorne. John died in 1881, and Margaret moved to Fennell's Corners and worked at the Post Office. Margaret died in 1911. William Bolton lived at part of lot 16, conc. 11 in 1866. He married Ellen Willoughby who only lived unitl 1876. William died in 1908. Mary Ann Bolton married John Metcalfe, and lived her whole life in West Gwillimbury. In Memory of JOHN THORPE died Sept 5, 1902 Aged 74 yrs. ANN SCANLON Beloved wife of John Thorpe died Feb 21, 1888 Aged 67 yrs. For other Ancestral Families connected to Clarence; METCALFE*; SIMPKIN; BOLTON; SCANLON; TINDALL; SEDGEWORTH; KEAM & COUCH. .